Skinny Girl In Transit 10 June 2016 Skinny Girl In Transit – S2E4 – Reality Check 1 Hadiza gloats about having dinner with Mide, and Tiwa is in for a rude awakening. Watch! The Juice 08 June 2016 The Juice S3E4 – Lynxxx Today on The Juice, Jollof Music maker, LYNXXX is on the couch with DSF talking about how he got his moniker, his long break away from the music scene and how his music has evolved over time. 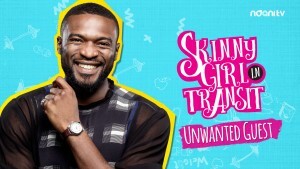 Skinny Girl In Transit 06 August 2015 SKINNY GIRL IN TRANSIT – S1E4 – UNWANTED GUEST Tiwa gets a surprise visit from an unwanted guest, and her mom is already planning a wedding in her head.